Check out the call for papers for more details! Suzan Afacan, a PhD student working with Laura Albert McLay, presented an integrated model for infrastructure (transportation) network recovery to enable service (emergency response) network actions. A journal article is currently under review. Several students working with Kash Barker presented recent research related to the CRISP project. PhD student Yasser Almoghathawi discussed an approach to identify important components in interdependent networks based on their contribution to interdependent resilience. This approach makes use of a resilience-based optimization formulation interdependent network recovery, a manuscript for which is under review with authors Yasser, Kash, and Laura. PhD student Nazanin Morshedlou presented network recovery optimization models considering both binary and proportional component restoration, with application to the topology of a French electric power network. PhD student Mohamad Darayi presented a network recovery model that extends the traditional topological or flow-based perspective to guide recovery decisions from a multi-regional, multi-industry economic impact perspective. He applied his model to a multi-modal transportation network. MS student Matt McCarter extended prior work in robust network vulnerability reduction resource allocation to multi-commodity networks with an application to equitable resource allocation in the Swedish rail network. Finally, MS graduate and current Vanderbilt PhD student Mackenzie Whitman presented her thesis work on component importance measures for multi-commodity networks, also applied to the Swedish rail network. 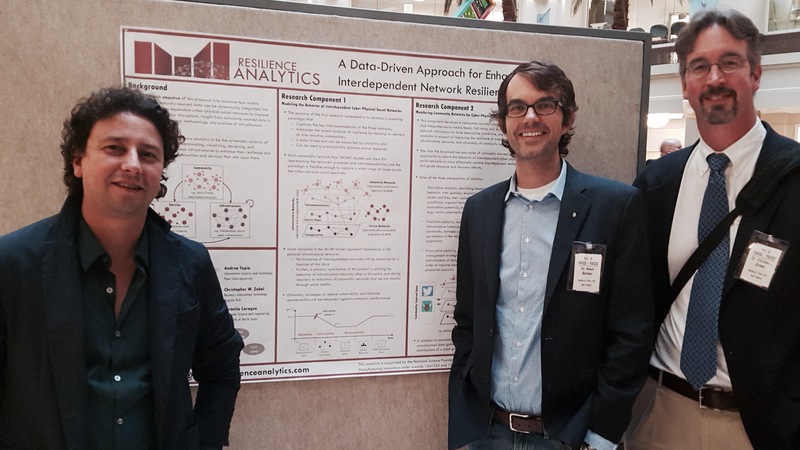 Jose Ramirez-Marquez and two of his students presented work in resilience analytics. Dante Gama Dessavre discussed his work in multidimensional resilience measures, and Andrea Garcia Tapia, with Dante, presented a visualization technique for relating such multidimensional measures over time. The visualization was performed for large-scale meteorological events in Mexico. Chris Zobel discussed work related to service networks in the form of equitable disaster relief asset pre-placement and cooperate crisis supply chain management. Kash, Chris, and Jose attended the National Workshop on Resilience Research in Arlington, Virginia. Among several infrastructure-specific keynotes and breakout sessions to discuss current research questions in various resilience-related topics, the workshop served as a kick for CRISP awardees. A review of quantitative approaches for describing resilience has appeared in the journal Reliability Engineering and System Safety. It offers among the first reviews of quantitative resilience measures for engineering systems. Team members Kash Barker and Jose Ramirez-Marquez, along with Ph.D. student Mohsen Hosseini, co-authored the paper.